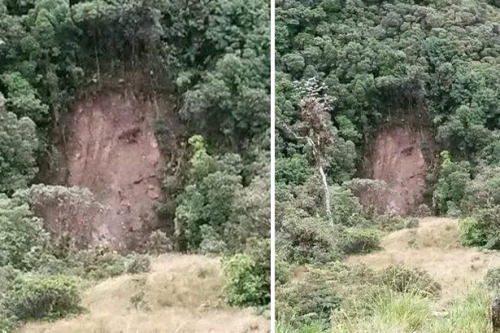 An image of Jesus is believed by worshippers to have appeared following a landslide. The apparition is attracting hundreds of visitors to the San Francisco area of Putumayo, Colombia, since Saturday. And some local landowners are cashing in on the ‘miracle’ – by charging visitors for access to view the figure, it has been reported. A police presence has also been necessary to manage the crowds. “If you believe in Jesus you will see your image ,” Ximena Rosero Arango, one of the many people who have come to the site to photograph the mountain told Eltiempo.com. And for more cameos of the world’s most popular zombie, clickez-ici. Looks like the Green Man to me. 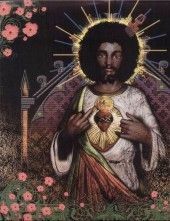 I don’t remember Jesus having such a kickass afro.